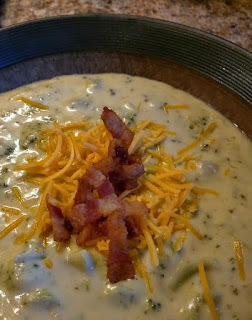 Today started out to be a cloudy, gray, and rainy morning and I had a taste for a nice thick and creamy Broccoli Cheese Soup. This recipe was actually a copy-cat recipe I found on the web for fast food restaurant, Panera Bread. 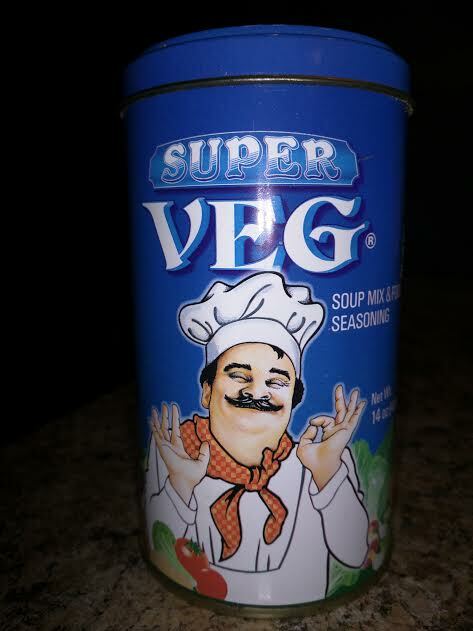 This soup is VERY VERY GOOD! 5 Spoons out of 5! The only modification to this recipe was adding 1 1/2 teaspoons of Super Veg Vegeta Soup Mix and Seasoning. It is a product of Hungary and is used in a lot of Polish recipes. That is how our family discovered it. It has a chicken bouillon base and includes dehydrated vegetable flakes. together the melted butter and flour over medium heat for about 3-4 minutes. minutes until the broccoli and carrots are tender. then serve. For a smoother soup puree it in a blender... but I love the chunks! A nice pot of thick, creamy broccoli soup on a rainy day just screams for a bread or muffin. 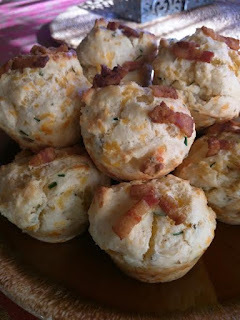 How could it be wrong with bacon and cheddar cheese in them. 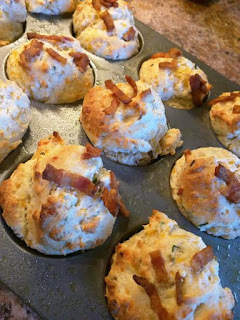 I chose these muffins because the cheddar cheese and bacon in them paired perfectly with the bacon and cheddar cheese soup in the Cream of Broccoli Soup made today. 2. Preheat oven to 400 degrees F (200 degrees C). Lightly grease muffin pan. 3. In a large mixing bowl, combine flour, sugar, baking powder, salt, garlic powder, chives, parmesan cheese, cheddar cheese and crumbled bacon. Combine the egg, milk, cream of mushroom soup and vegetable oil. Mix into the dry ingredients and stir together just to moisten. 4. Spoon the batter into prepared muffin pans and bake at 400 degrees F (200 degrees C) for 20 to 25 minutes, or until a toothpick inserted into a muffin comes out clean.